Organisations and people need simplification to manage complexity and derive ‘big or complex things’ into smaller and manageable systems – where a system is a set of interacting elements (or sub-systems) having an internal structure which links them into a unified whole. To that effect, optimising or implementing a new system requires its boundaries and internal structure linking its elements to be clearly articulated (logical, technological, physical, etc.). This decomposition approach is very relevant to the manufacturing industry where product complexity has grown exponentially over the past two decades. Every product and service can be described as an overall ‘system of systems’ which constitutes a collection of task-oriented or dedicated elements that pool resources and capabilities together to obtain a new, more complex ‘meta-system’, with greater functionality and performance than simply the sum of the constituent systems. To that effect, Systems Engineering emerged from the need to conceptually understand a product and to ensure an adequate design early in the development phase. Its objective is to produce a complete, consistent and feasible system specification upon which the product can be built. Due to this increasing complexity and need for development speed, systems engineers started to employ models to simulate structural stability, behaviour, cost and other technical aspects ahead or in substitution of actual physical validation. Systems Engineering helps combining multiple technical and business disciplines while focusing on how to optimise the design and management complex systems over their respective lifecycle. Historically, Product Lifecycle Management (PLM) models were developed on the classical way of knowledge-based feature driven methodology, mechanical product structures were integrated with, electric, control electronic, hardware, and software units. Conventional mechanical, electrical and materials engineering concepts, methods and processes should be revised to prepare the change for PLM modelling of multidisciplinary products. Modern PLM platforms are expected to leverage Systems Engineering approaches to embed modelling methodologies and put simulation of mechatronics structures together with associated materials engineering and software management at the core of the engineering-manufacturing cross-loops. From a broad perspective, this is also referred as Model-Based Systems Engineering (MBSE) with the formalised application of modelling to support cross-system and cross-disciplines feedback loops. MBSE workflows apply across the entire “V-model”, starting from the product conceptual design phase, continuing throughout its development and later lifecycle phases. Deliver innovation faster across the full value chain and across disciplines, from mechatronics to software development (horizontal integration: functional alignment). Improve conceptual modelling, downstream validation and data reuse (systems, hardware and software assets). Contribute to enhanced collaboration and better results, including robust feedback loops between engineering and manufacturing (vertical integration: upstream and downstream). Validate complex behaviour earlier in the design lifecycle. Better manage holistically traceability and knowledge. It is worth noting that every disciplines are likely to follow their own lifecycle and V-models. The critical success factor is to manage alignment through requirement cascade and dependency management, not to try to align all requirement to a single model, but to an interdependent ecosystem – which can be for example illustrated and govern as per the IT4IT architecture framework. MBSE is one of the key application of a Systems Engineering approach, i.e. the connection of Requirements to Functional to Logical to Physical structures (RFLP). Developing complex and large products require adequate systems engineering processes based on layered RFLP to deliver close-loop system design before delivering requirements to lower layer systems. Requirements and test cases, which define the contextual needs with use cases, functional and non-functional requirements. Functional architecture, which describe what the system must do, from a capability point of view. Logical architecture, which defines how the system is implemented. Physical, which includes components/software, implementation parameters, a virtual definition of the real world product, including 3D representation to “visualise” the targeted system concept in the early phases. PLM is the de facto platform that provides processes and tools to manage the product development lifecycle in common context; it includes the management of their logical interdependencies in order to manage effectively work products from mechanical, electrical and software engineering. However, the overarching hardware and software integration traditionally remains informal and is rarely documented adequately. Current RFLP practices seem to be tracking multiple structures (one for R, one for F, one for L, and multiple for P), revision controlling those structures, and interconnecting the structures with relationships for traceability. End-to-end change and configuration management integration and automation become key enablers for RFLP practice to be optimised and effective across each of the R-F-L-P elements and across each discipline. Horizontal integration is becoming increasingly critical, especially in providing the relevant data backbone for manufacturing execution. With the rise of smart manufacturing, the Industrial Internet of Things (IIoT) and Industry 4.0, model-based development methodologies are becoming more and more powerful to define the relevant “digital twins”, for both product development and plant operation optimisation. In the new era of smart factories, Cyber Physical Systems (CPS) combined with MBSE have the potential to monitor processes, create virtual reality of actual operations, act independently and use IIoT to communicate and cooperate with other systems and humans in real time.‌ Manufacturers are required to demonstrate that products are diligently developed and manufactured using state-of-the-art methods to successfully guaranty safety and legislation compliance. Going forward, MBSE and PLM are expected to converge toward true Model-Based Engineering (MBE) and enable the effective transition from document-based to model-based. 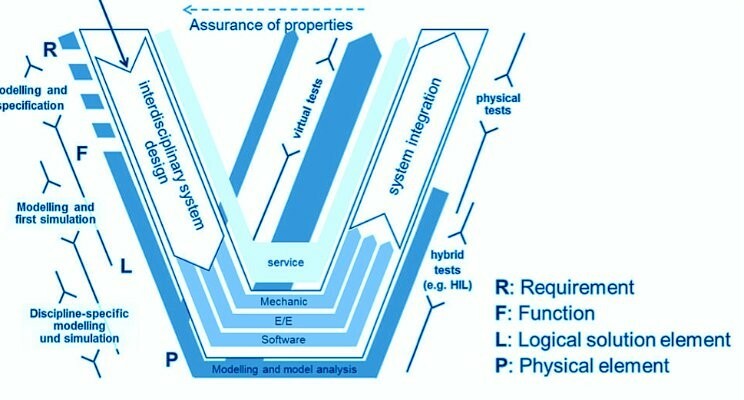 This eco-system is expected to encompass a set of methodological interdisciplinary approaches to engineering that uses models as an integral part of the technical baseline that includes the requirements, analysis, design, implementation, and verification of a capability, system, and/or product throughout the acquisition lifecycle. MBE is a challenging, but a solvable problem through a combination of standards (industry level and/or company level) and linked lifecycle data (requirement and change management, combined with automation, performance monitoring and continuous quality improvement). Standards such as Open Services for Lifecycle Collaboration (OSLC) or Product Life-Cycle Support (PLCS) contribute to conform independent software and product lifecycle tools to integrate their data and workflows in support of end-to-end lifecycle processes. This post was originally published on LinkedIn on 20 May 2017.